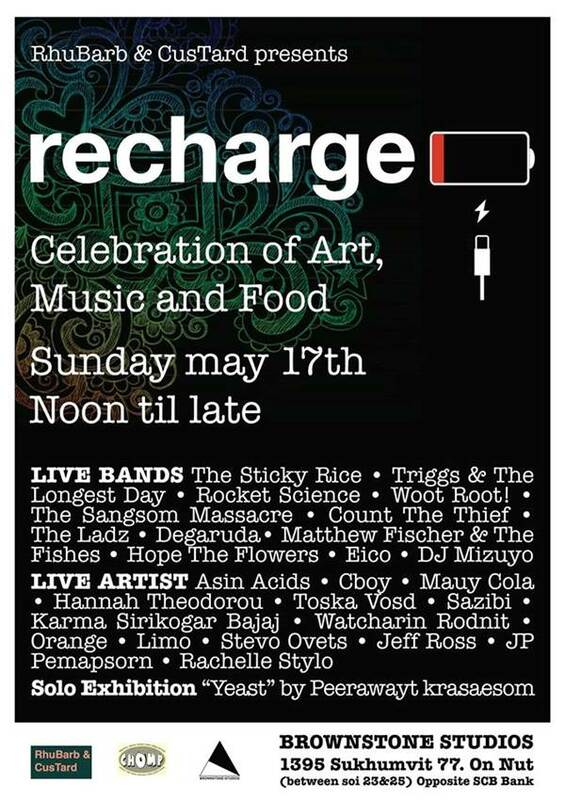 The cream of Bangkok's musical, artistic and culinary talent come together next month for RECHARGE, an exciting celebration of all that is creative in this unique city. The day-long event at BROWNSTONE STUDIOS is curated by Joe Delaney of RhuBarb and CusTard Promotions, and will feature a host of local and international artists. The heady mix of music, food and art from around the world promises to delight and stimulate all those attending. Established musicians including Thai favourites THE STICKY RICE and Glasgow/Bangkok's THE SANGSOM MASSACRE will be there, as well as TRIGGS & THE LONGEST DAY, ROCKET SCIENCE, WOOT ROOT!, COUNT THE THIEF, THE LADZ and DEGARUDA. Other acts already confirmed include MATTHEW FISCHER & THE FISHES, HOPE THE FLOWERS, EICO and DJ MIZUYO not to mention many up and coming and unsigned artists. More acts are being added as we speak, so keep an eye on our facebook page for regular updates. The day will also feature live street art and new works from artist such as ASIN ACIDS, CBOY, MAUY COLA, HANNAH THEODORU, TOSKA VOSD, SAZIBI, KARMA SIRIKOGAR , WATCHARIN RODNIT, ORANGE, LIMO, STEVO OVETS, JEFF ROSS, JP PEMAPSORN and RACHEL STYLO, and there will also be the chance to view PEERAWAYT KRASAESOM's new solo exhibition 'YEAST'.